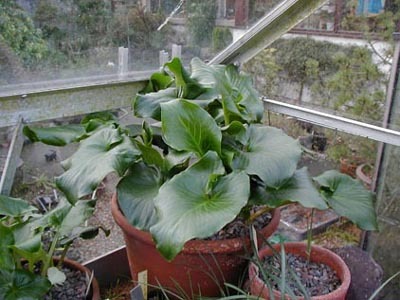 The big freeze has gone for now and we can see what has become of the frozen Arum and Cyclamen. All the water in their leaves had turned to ice and they were solid to the touch not to mention looking very sad indeed. Good news they have both survived and made a complete recovery. This happens several times every winter, sometimes they remain frozen for two weeks or more. The warming cables that we have in the plunge prevent the roots and bulb from becoming frozen which would result in the death of the plant but have very little effect on the air temperature. 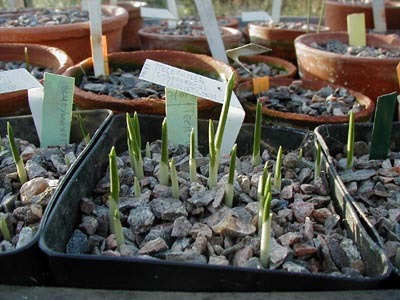 I hardly ever close the doors to the bulb house, I think there is a greater danger to the bulbs from a rapid increase in temperature which would be the result of the sun hitting such a small volume of air enclosed within a small glasshouse. Left alone, do not touch the frozen leaves, the plants were allowed to defrost slowly and suffered no harm having been frozen for three days. Tecophilea leichtlinii is showing as are all the other forms of tecophilea that we grow. This is normal as they are always showing above the gravel by the end of December it will be at least another six or eight weeks before we get any flowers on these South American beauties. Another South American bulb we grow is Tristagma leichtlinii not so attractive as tecophilea but interesting, I will try to remember to include a picture when it flowers. 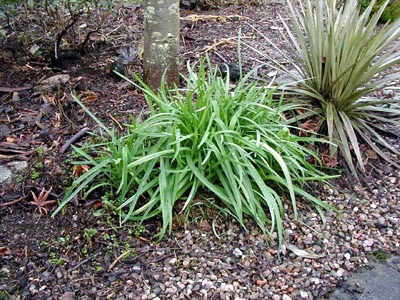 Last year I think I planted a few Tecophilea bulbs out side to see if they would prove hardy in Aberdeen, I certainly intended to I must have a look where I think I planted them. I think all this is getting to me. 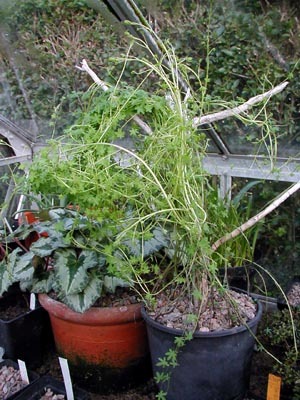 Tropaeolum tricolorum is also well into growth as is T. azureum both usually come through in November growing slowly at first and gathering pace as the year turns. One South American bulb which is hardy is Ipheon Alberto Casteillo people in the south often questioned me when I stated that this bulb was hardy as it had a reputation of being tender, I can assure you that it has grown outside in Aberdeen for approaching 10 years. 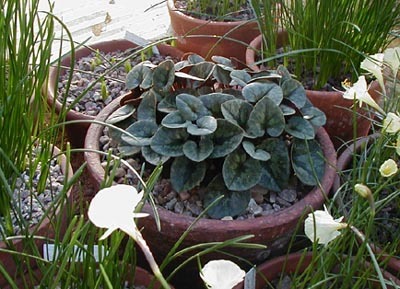 The leaves appear in late Autumn and provide an attractive foliage feature through out the winter. 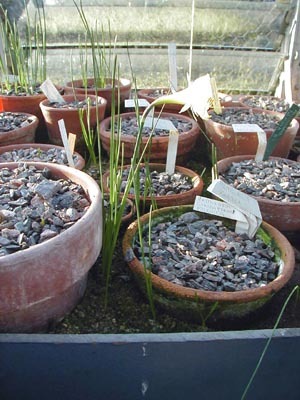 For years I collected the seeds and sowed them in pots with the other bulbs but never got any germination so I stopped collecting the seed. 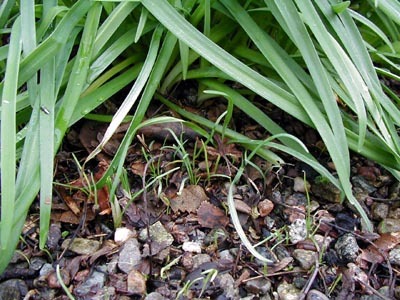 Now there are self sown seedlings appearing all around the plants. Nature always knows best and we must learn by observing what is happening, as soon as I have worked out the ipheon secret I will let you know. Talking of self sown seedlings the plunges of our bulb houses are full of bulbs that have self sown. The annoying thing is that they usually flower a year quicker in the plunge than they do when we sow them in pots. I pondered this and came up with the answer that the Narcissus, Crocus and Tecophilea seed which are all round were sown deep down in the plunge where as I sowed them on the surface with a covering of grit. By being buried they do not have to work themselves down therefore save energy and time and flower quicker. I think that in the wild most of these round seeds which also have a small white appendage or attractive coating are taken underground by insects, probably ants, and have thus evolved to perform best under these conditions. I now sow all this type of seed half way down the pot and cover them with compost to great success.